The Slim d’Hermès collection epitomises finely balanced proportions, striking the perfect balance between form and function. With the new Email Grand Feu model, the Maison achieves the impressive feat of offering a timepiece with an aesthetic that can genuinely be defined as essential. The well-established Hermès penchant for the graphic arts is illustrated through the typographic sophistication of the Arabic numerals. Designed by the artist Philippe Apeloig as geometrical shapes freed from any superfluous elements, these figures mark off time with refined elegance, admirably offset by the elegantly understated Grand Feu enamelled dial. 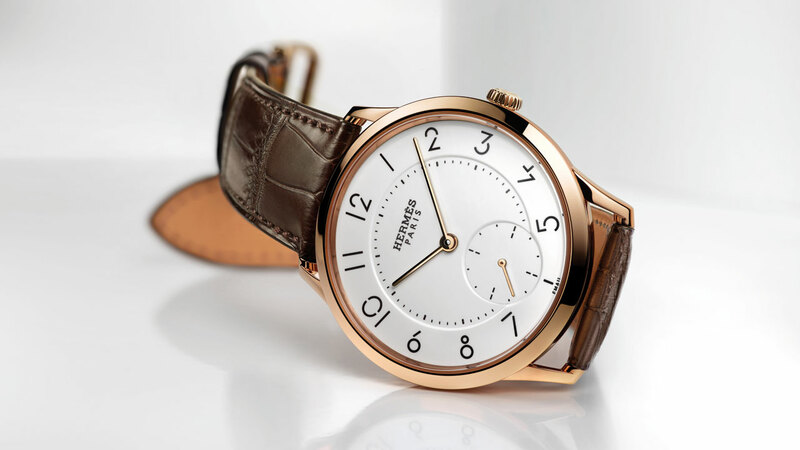 In the Hermès workshops, the quest for purity extends to the pink gold case whose slim frame houses the ultra-thin Manufacture Hermès H1950 movement. 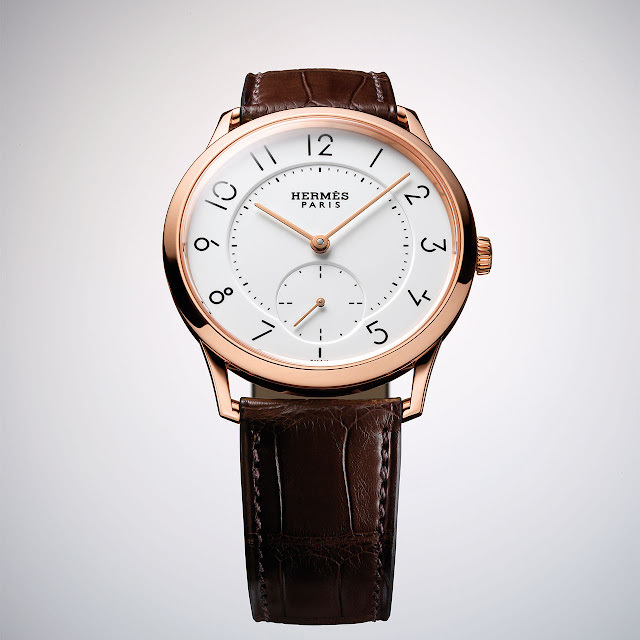 This fascinating horological composition is issued in a 100-piece limited edition. Mechanical automatic, ultra-thin Manufacture Hermès H1950 movement; micro-rotor, 29 jewels, 21,600 vib/h, special Hermès decoration (H symbols), hand-chamfered bridges, 42-hour power reserve. 18K pink gold, 39.5 mm. Anti-reflective sapphire crystals, front and back. Caseback engraved with the limited-edition number. Water-resistant to 30 metres (3 bar/100 ft). White Grand Feu enamelled dial, black enamelled transferred minutes track and Arabic numerals. Small seconds at 6 o’clock. Matt havana alligator, 18K pink gold buckle.